Is it summer yet? Seriously, y’all. I’m not built for cold, rainy, gloomy weather. It’s miserable and depressing. Thankfully today is sunny and considerably warmer. And it’s Saturday, so I’m not cooped up in an office all day and can actually enjoy it. As a matter of fact, I’ll be spending part of the day with my Little today, so I’m extra excited about that! I’m also very excited to (finally) share this delicious burger with you!! 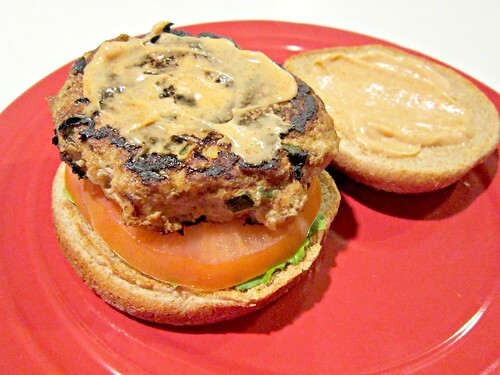 Delicious turkey burgers packed full of smoky, southwest flavors. You can’t go wrong with a burger like this. I’ve actually made this burger a couple of times, and finally got a photo of it this time ’round. The ingredient list is really quite simple, despite the amount of flavor you get with each bite. The roasted poblano gives it a nice smoky flavor, as does the chipotle chili powder. And the chipotle mayo. The light, crispness of the lettuce and tomato are a nice balance with the smoky heat of the burger. You can, of course, adjust the amount of chipotle you put in the mayo, or nix it altogether if you aren’t a spicy fan. But I don’t recommend it. Add a little less maybe, but you want it. Trust me. We had our with chipotle sweet potato fries, so we were getting the heat from all sides. Ketchup is a nice “heat” cooler. Just a little helpful tip there for ya! Turn your broiler on hi, line a baking sheet with foil, and spray with cooking spray. Cut the top off your poblano pepper(s), remove the seeds, and slice in half. Lay the pepper(s), cut-side down, on the baking sheet and broil for 5 to 10 minutes, or until you see blistered (black/brown) spots on the skin. Remove the pepper(s) to a plastic bag or container with a lid and seal or cover for about 15-20 minutes. This helps the “steam” the skin so it is easier to remove. Remove from the container and peel the blistered skin off of the pepper(s), then dice. Combine bread crumbs and milk in a large bowl and set aside for 5 minutes. Then add 1/2 tsp chili powder, cumin, salt, black pepper, red pepper, ground turkey and diced peppers. Use your hands to gently combine. Divide the mixture into four ½-inch thick patties. Spray a grill pan or skillet with cooking spray and cook the patties for about 3 to 5 minutes per side, or until cooked through. Meanwhile, combine the miracle whip or mayo and the remaining 1/2 tsp of chipotle chili powder in a small bowl. Spread the mixture on one half of each of the buns, then top each with a leaf of lettuce, a couple of tomato slices, and a patty. Add a little extra sauce, if you’d like. Serve with sweet potato fries or your favorite side!